So there I was with a handful of poems from my ill-fated ‘Business Class’ collection that couldn’t find a home. What to do? I started thinking about the themes: workplace tensions, multicultural office environments, illicit relationships, anomie…and shoes! Why hadn’t I thought of it before? I was working in the sports shoe industry. And I realised shoes have been a theme in my life – from doodling enormous platform boots all over my rough book at school, to my first job in a shoe shop, to persuading my bosses at Nike that netball was a viable sport and players needed netball shoes. I picked over what I had, chose a few unpublished poems and adapted a couple that had been published, added in a few new shoe-themed poems, and the little collection made a good narrative arc. 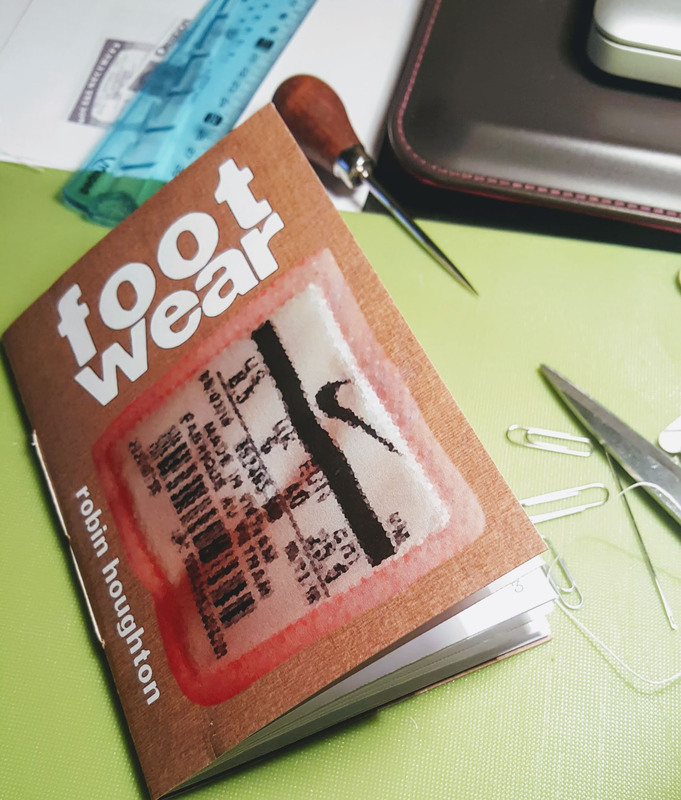 Shoes are made by hand, so why not the pamphlet? 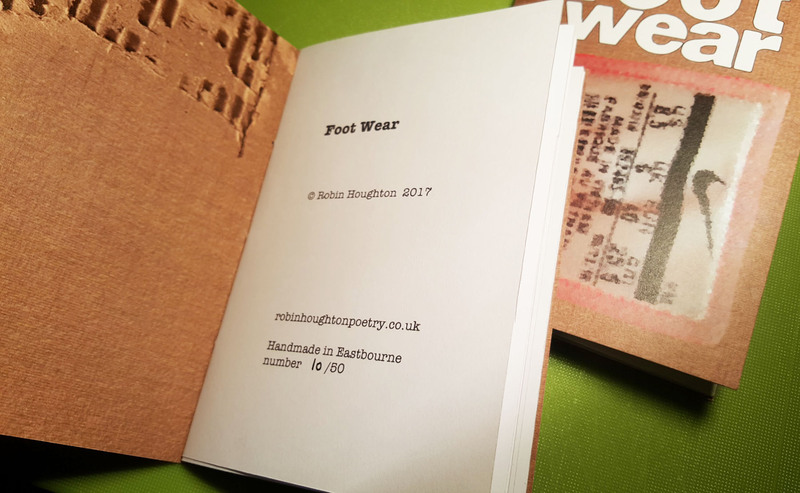 I wanted this to be a small collection of poem ‘vignettes’, semi-autobiographical, related to my life in shoes, in limited edition. I wanted each poem to be accompanied by a photo. 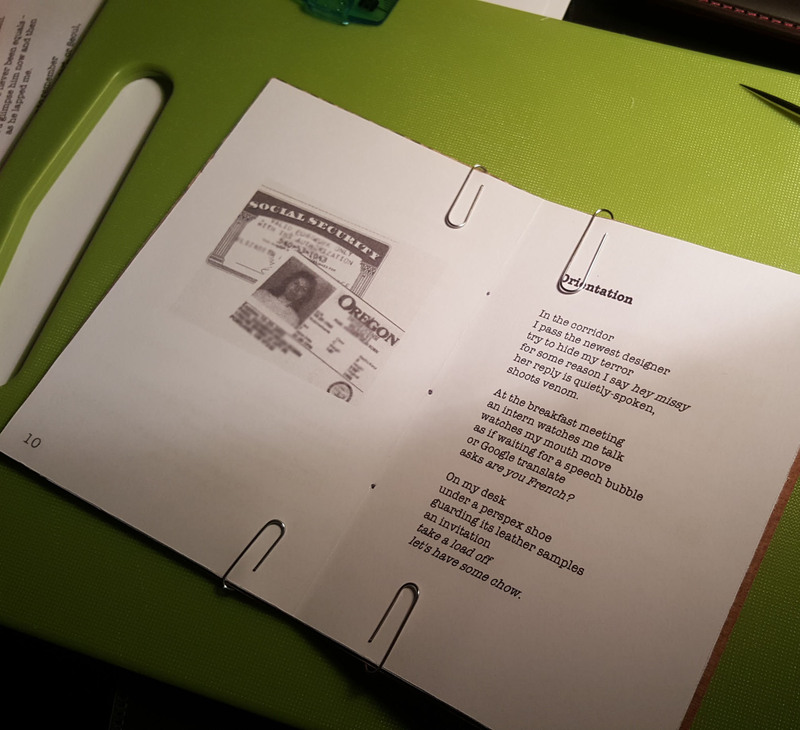 I also wanted to make the pamphlets by hand, as much as possible – not hand written and not handmade paper (would be nice, but very expensive) – but hand-bound and finished. 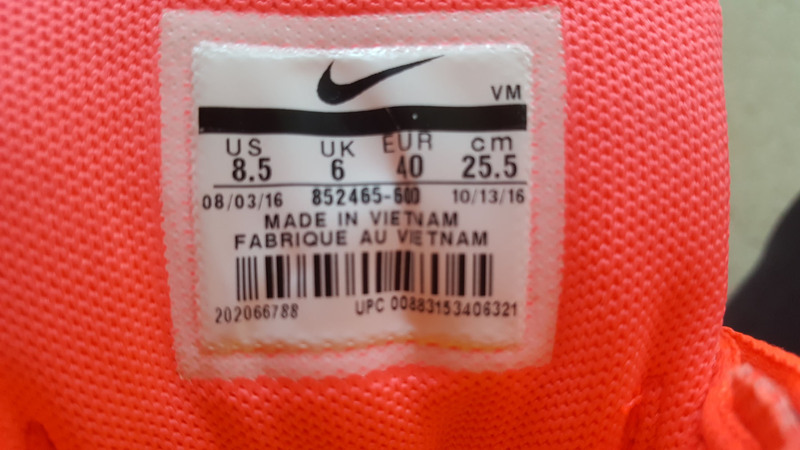 The point is that the trainers we wear are by and large handmade – from the pattern cutting to the stitching, dyeing, glueing and finishing – by hundreds of assembly-line workers in the far east, and it’s skilled work. The least I could do, to pay homage to that process, was to make the pamphlets myself. My plan was to print the inner pages on my office printer. I was excited to find A5 paper for sale online, and I ordered it in 170gsm, a bit heavier than normal printer paper. I thought perhaps there’d be less chance of a printer jam and the heavier weight would look classier. I hadn’t really considered the thickness of the finished article. But with only twenty pages it turned out fine in the end. Similarly, I had the covers printed in 380 mic pulp, which turned out quite thick – but I don’t regret it. I had no trouble folding the pages in the end because I had a lovely bit of kit called a bone folder. 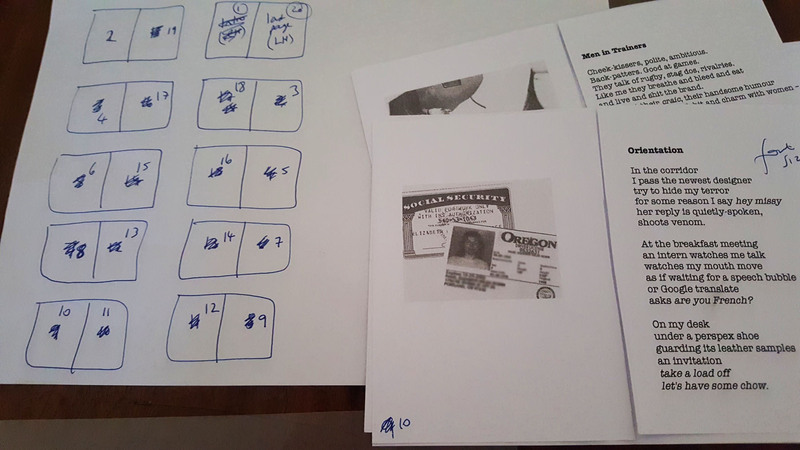 The first challenge was to print the pages in the right order, with the correct back-to-back pagination. This proved harder than I thought and I wasted quite a few sheets of paper in my frustration! Anyway I succeeded in making a mockup, glued together, which became my blueprint. There then followed the sloooow process of printing the pages. Ten at a time invariably meant a misfeed of the paper, which when it was side two being printed meant reprinting all over again both sides. Ugh. Meanwhile I created a cover design using a photo of the tongue label from my trainers and a background image suggesting a cardboard box. This I had printed at an online printers. I was looking forward to binding the pamphlets. 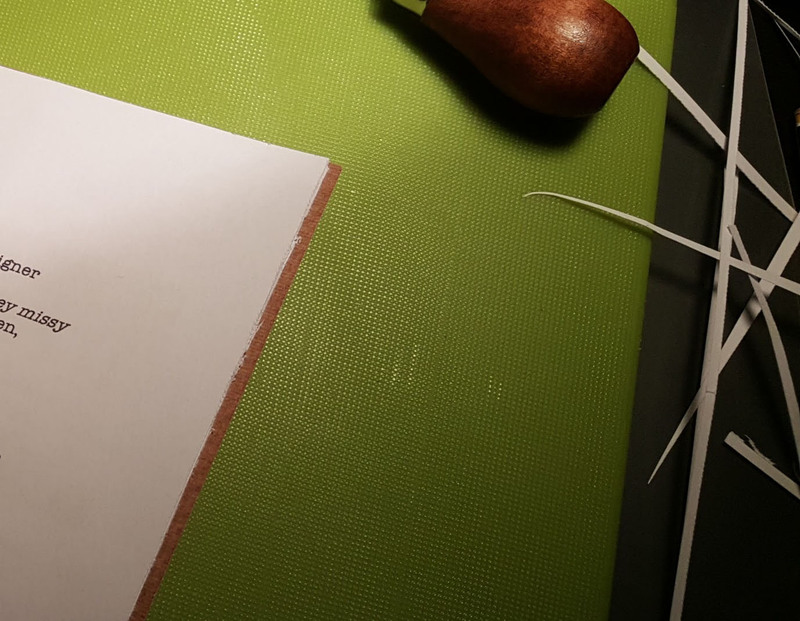 I bought a ‘bookbinding starter pack’ from a wonderful shop based in the Orkneys called the Vintage Paper Company, and followed their instructions for how to make the simplest of bindings. That was it! 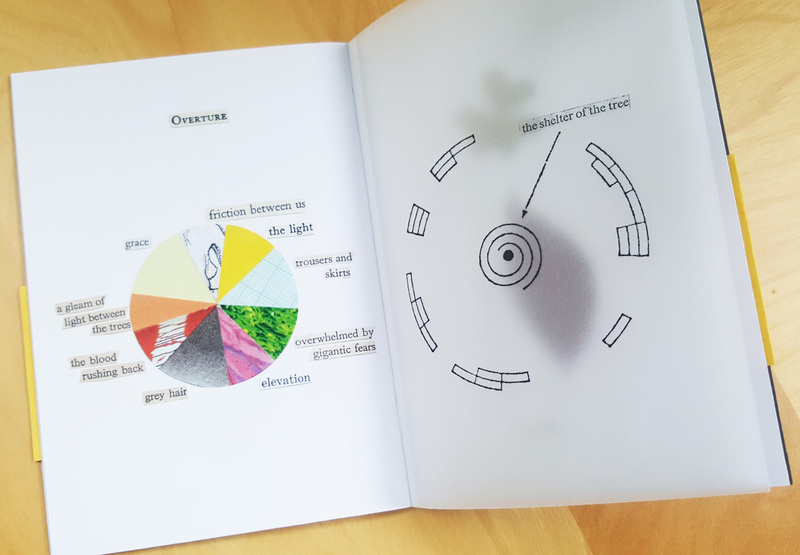 Or so I thought… I realised then that the pages protruded outside the cover. They would need trimming. After trying unsuccessfully to trim a thickness of 5 sheets using a blade, I realised I’d have to do it singly. In the end I got quite good at it, although there were a few rough edges I thought that was fine – all part of the quirkiness/individuality of each pamphlet. The final product is lovely, if I say so myself! I’ve only made ten so far, and there’s going to be a limit of fifty. My plan is to sell them at readings. In fact I made my first sales on Monday evening in Winchester – more about that in the next post! Aw, thanks Peter. Do you want me to send you details? Yes please. You have my email. Ah, this post should be wonderfully useful for my third-year students, who will be making a pamphlet of their own poems as part of the module! Many thanks! Glad it might be of interest to your students, Carrie! You are a genius I love it all! 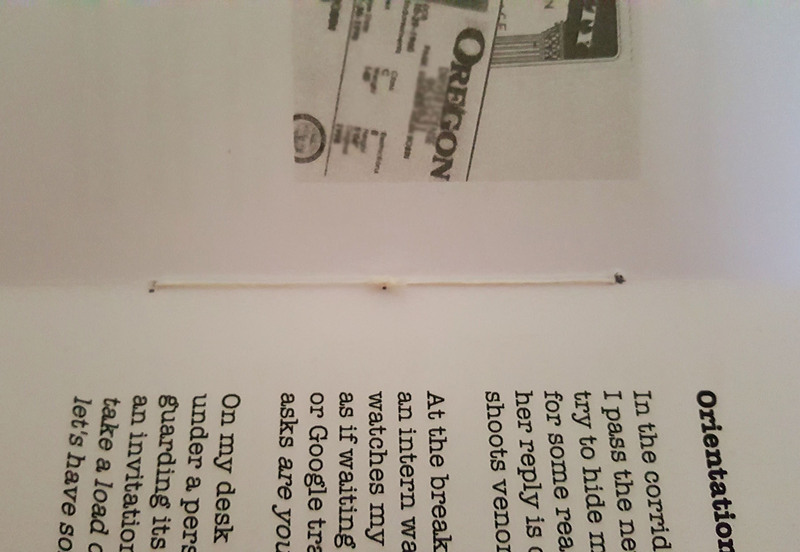 A friend made a tiny book of poems for her brother. I love linking art with poetry myself! Fab post and the end product looks wonderful too. What a great idea. I’ll look out for them at the next reading. Wishing your publishing project, and your poems, success. Thank you Elly – and for sharing on Twitter as always, I really appreciate it! That must have taken some patience and skill (says one who struggles with wrapping Christmas presents). Ha ha! Not sure about the skill but I’m working on it! Thanks so much – and for your RTs also! Fascinating! I’d love to buy one too. Thank you – I will reserve you one for when we next meet! I work in the print trade and am often struck by how soulless the end product often feels. What a brilliant idea, especially for pamphlets, which always feel so personal compared to the breadth of a full collection. Cap doffed! Thank you Ben for your kind words! Hi Robin sounds great! Congratulations on doing this. Can you keep one for me, please?